Lea, your beads are beautiful! How do you describe your work? I make handmade wearable glass art and unique jewelry. I started out as a jewelry maker (self taught), mostly stringing and simple wire work and most recently to beadweaving. I’ve always been fascinated with glass. I have a collection of some lovely art glass sculptures in my home so when I saw that a local art league was offering lampwork classes, I quickly signed up. It was a beginner class, which gave me the basics. 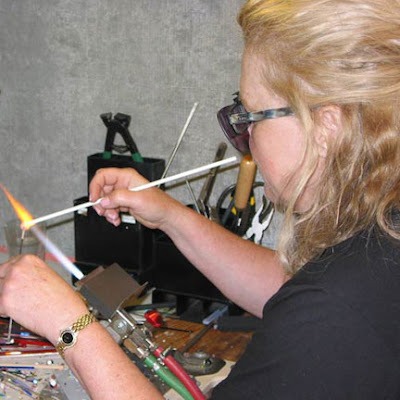 I since have taken 2 additional classes at Beadfest Philly for working with boro glass. I wish there were more local classes to take advantage of. I had a very hard time coming up with a business name I liked. LA are my initials. Pretty simple when you think about it. And Jewelry Designs is fairly self explanatory, though I have expanded beyond just jewelry making. I first decide which COE (coefficient of expansion) glass I want to work in that day. It’s important to keep glass of different COE’s from getting mixed up or the beads will crack. COE is really just a measure of the rate at which a particular type of glass expands when heated. When you have glass expanding at different rates, the beads will crack, which is something you want to avoid at all costs. 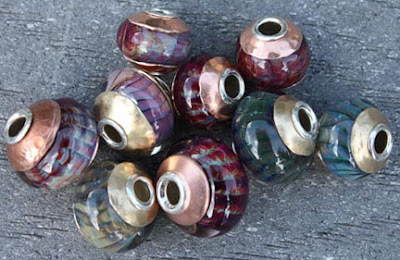 Imagine spending all that time shaping & decorating a bead only to have it crack….not a good thing. After that, I sometimes have a particular style bead that I want to work on, but more often that not, I just let the glass “talk to me”. I’m not particularly fond of making sets, preferring to let my creativity flow, creating one of a kind beads. 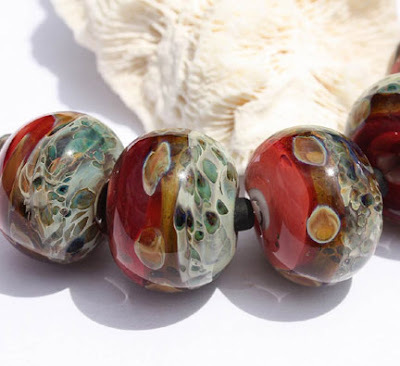 Though, oftentimes when making a particular bead that I like and picturing how nice it would look in a necklace design for instance along with others in the same style, I’ll just get into a zen like mode & fire off dozens of the same bead. This is where having the jewelry making background comes in handy as well. I took a basic lampwork class at a local art league….and I do mean basic. LOL! But it helped me get over my fear of how to light the torch, taught safety precautions and some basic beadmaking techniques. I knew from the start that I loved working with glass so I saved my pennies & as soon as I was able to, I went out & bought whatever equipment I needed. 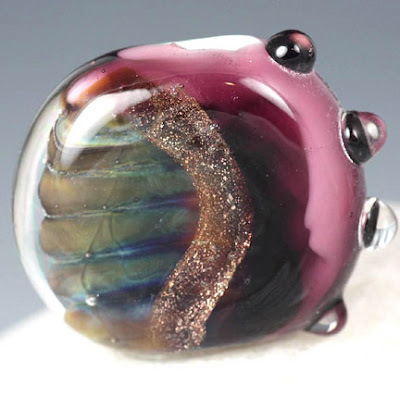 I joined several lampwork forums & poured over the all the information. I found some great tutorials and just went ahead and played. I find it a fun medium to work with because it’s ever changing & you have no choice but to try new things. Even if a particular session doesn’t turn out well, I still learn a lot, whether it’s how certain colors react together or how to shape my beads better. Great question. 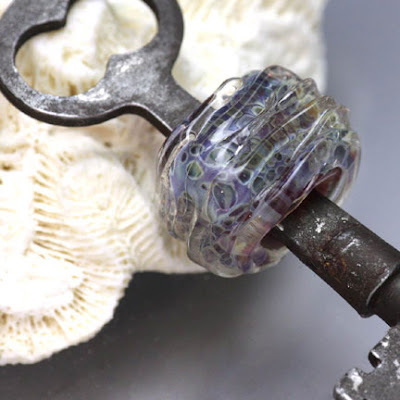 With lampwork, there are several tools that are required, but I just love my torch. Since working with boro, I upgraded to a “big girl torch” that has an inner ring and an outer ring that’s helpful for larger pieces. And though I don’t often work that large, there have been numerous times when I’ve found myself turning on the outer rings to get that extra boost of heat needed for a design. Knowing that tomorrow is another day. Some torch sessions I can do no wrong & others I can do no right even if I’m trying to duplicate a bead I’ve already made. So, though some days are very frustrating, I simply love seeing the outcome the following day when the kiln has cooled down. 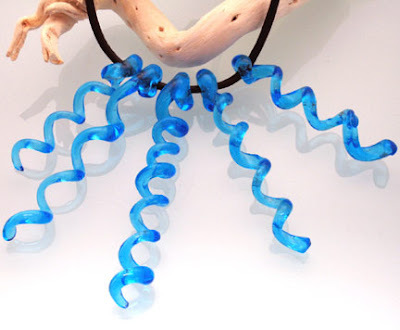 Even if the bead doesn’t come out as planned, I may come across a new color reaction that I can use in subsequent beads. PPP (practice, practice, practice), which is something I still need to do a LOT more of! Chocolate is the hands down winner. I wish I liked dark at least, but I never developed a taste for it. I love milk chocolate with some almonds or caramel or both. YUM!